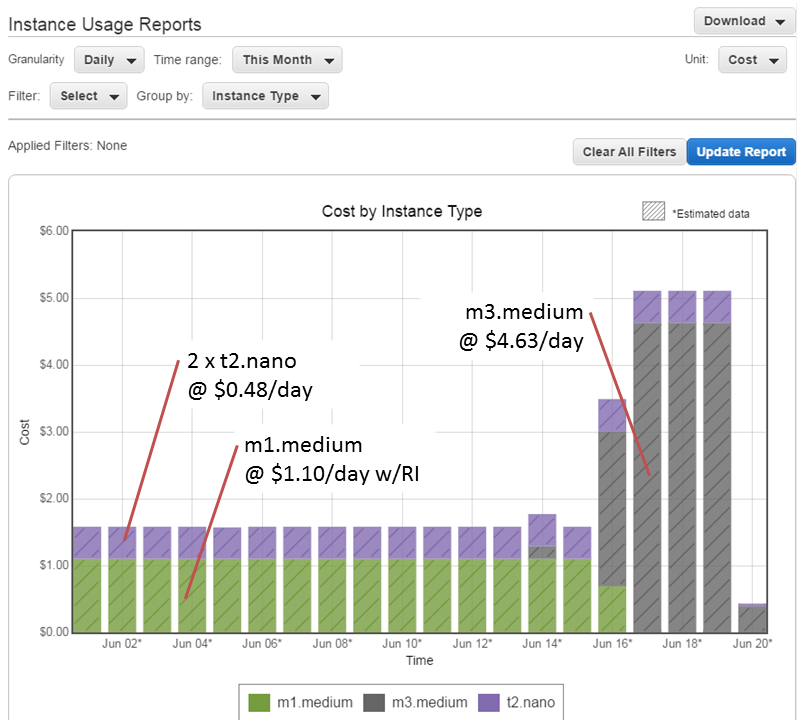 I’ve been running my APEX sites on Amazon EC2 for many years now, and I’ve gone through a number of infrastructure upgrades and price changes over time. I have some alerts set up, e.g. if a server starts getting very busy or if my estimated charges go over a threshold. Today I got an alert saying my estimated monthly bill will be over $100 which is unusual. As you can see, my daily cost was about $1.58 per day, and this shot up on the 16th (note: these rates are for the Sydney region). I was running Oracle on an m1.medium SUSE Linux instance until June 16, when I upgraded it to an m3.medium instance. I have a Reserved Instance (RI) for m1.medium, but not for m3.medium, which is why the cost has shot up. That RI will expire soon; I will purchase an m3.medium RI which will bring the cost of that instance back down to about $1 per day. Until I do that, I will be charged the “On Demand” rate of $4.63 per day. I’m also running two t2.nano Amazon Linux instances as my frontend Apache servers. Even though they are the smallest available instance type (nano), they barely register over 1% CPU most of the time. I’ve moved all the DNS entries across to one of those nano instances now, so I will soon decommission one which will save me a few extra dollars per month. As an APEX developer, outsourcing the hardware-related worries to AWS has been the best decision I’ve made. I’ve only suffered a couple of significant outages to date, and in both instances all my servers were still running without issue when connectivity was restored. I can spin up new instances whenever I want, e.g. to test upgrades (you might notice from the graph that I did a test upgrade on an m3.medium instance on June 14). In case you’re wondering, the total time I needed to take down my Apex instance, take a snapshot, spin up the new instance, and swap the IP address across to it, was about 30 minutes. And that included about 10 minutes lost because I accidentally picked an incorrect option at one point. Not only that, but my upgrade also included changing from magnetic disk to SSD, which seems a bit faster. Overall I’m pretty happy with all that.